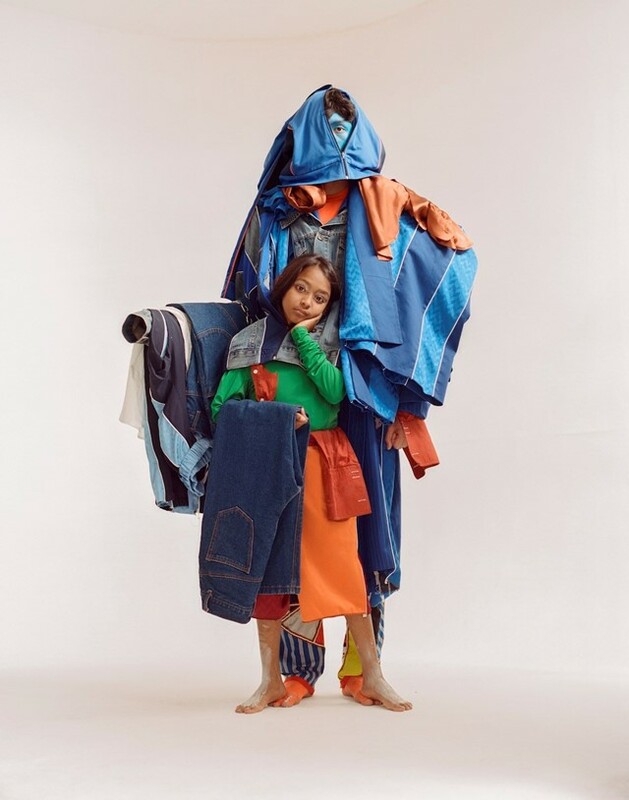 Today, a non-stop wave of young, upcoming designers are not only interested in bringing innovation to fashion, they’re also interested in pushing the industry towards a more sustainable future. Among this gang is Westminster MA graduate Priya Ahluwalia, who has a strong socially-conscious message that she wants to communicate via her designs. Coming from Indian and Nigerian backgrounds, Ahluwalia went on a trip first to Panipat, India and then Lagos, Nigeria to help inform her final collection. “It was a real eye-opener to see how much waste we all produce and how much we overbuy and dispose of,” Ahluwalia explains. Visiting the global centre for recycling in India, and witnessing the real-life effects of the second-hand clothing industry in Nigeria, the impact of what she saw became the main inspiration for her collection. Dissatisfied with just communicating her message through clothing, the designer used photographs that she took while on her trips to create a book entitled Sweet Lassi, produced by Harry Fisher – helping those who might be unaware to visualise the impacts of overconsumption in the clothing industry. The collection itself took inspiration from the idea of second-hand clothing, reworked in a forward-facing way, as she spliced together different parts of denim and nylon jackets, as well as patchwork knit vests, inspired by Indian men she saw wearing them, despite the sweltering heat. “Looking at the piles and bundles of all these different garments sticking out of each other, that’s when I thought of the idea of patchworking things to create a new textile,” the designer explains. Following the presentation of her collection at Westminster’s MA show, we caught up with Ahluwalia to find out more about Sweet Lassi. You’re finishing up the MA design course at Westminster. What has that taught you? Priya Ahluwalia: The course has been amazing. I’ve had guest lectures from the likes of Charles Jeffrey and Alex Mullins and I’ve been exposed to meeting all these new people. I’ve learnt a really great amount. It was where I started to engage and design in a socially responsible way, which was something that wasn’t really on the top of my agenda before if I’m honest. More and more we hear about things that humans are doing to the world, all these terrible things like when they find plastic at the bottom of the deepest part of the ocean. People are so obsessed with producing more, but you can do it in a way that considers the responsibilities we have to the planet and to future generations. Sustainability as a message is a strong part of Sweet Lassi. How did you first come up with the idea for the book? Priya Ahluwalia: When I went to Panipat, which is the subject of my book, I saw the global recycling centre of the world. I went there for research for my Masters, but then I ended up wanting to do the book because I took all these photographs. When I saw the sheer amount of clothing that was piled high in these warehouses and in these massive lorries that have all the clothes hanging out the back, it was a real eye-opener to see how much waste we all produce and how much we overbuy. Priya Ahluwalia: I kept seeing street traders in really obscure t-shirts and I remember one guy had a London Marathon t-shirt on and another had a Mud Run Norwich t-shirt. I was really curious so I opened the window and asked them where they got these clothes from and the explained that they got them from a second-hand market stall in Lagos. That’s when I found that a lot of the time when you donate your clothes to charity they don’t actually get given for free to warehouses, they get sold for profit and then the government sell them on to traders and it becomes a business. What are some of the impacts of the second-hand clothing industry in those areas? Priya Ahluwalia: The second-hand clothing industry really damages the local textile industry. India doesn’t allow the resale of second-hand clothing, they’ve completely banned it – it’s only allowed to cross the border if it’s been torn or ripped and it’s going to be recycled. Instead, there are organisations that hire rural women who would not usually be able to work into full-time jobs with fair wages and they teach them traditional Indian textiles. Developing countries are really being affected by this big business, with cheap clothing coming over, so that was something I really wanted to concentrate on too. What do you hope to achieve with Sweet Lassi? Priya Ahluwalia: I wanted to raise awareness with the book. I was just shocked that I could buy something that was made in India, wear it for two, three, four years, give it to charity and then it gets shipped back to India. These places are doing a really good job though, the places that are mainly photographed in the book. They recycle the clothing into fibres used for relief blankets, so I think that’s really good - without them, it would be a lot worse. I think everyone could just make slightly smarter choices with consumption. Why is your dual-heritage an important part of your designs? Priya Ahluwalia: It’s an obvious thing, I am a dual-heritage Indian-Nigerian woman and it’s just how I’ve grown up. It’s a real tapestry of culture, visual aesthetics and everything that I know first hand. I just get drawn to it in the same way I get drawn to things from London. When I’m thinking about things in terms of design and aesthetics, I think about the way in which girls used to dress in London when I was at school. There’s definitely beautiful things from either side of my heritage that I’m inspired by and from growing up in London as well. What were some of the inspirations behind your MA collection? Priya Ahluwalia: The trip was really the catalyst for my final collection. I knew I wanted to look at second-hand clothing, but it wasn’t until I had been on the trip to Panipat and Delhi that it came together. I like tailoring, I like sportswear, and I like knitwear, so I wanted to bring it all together in a graphic way. When I was in India, I kept noticing lots of guys wearing knitted pullovers, it was so hot and I noticed it everywhere, so that made me think I’ve got to make a few of those. If I hadn’t have gone on my trip it would have been a very different collection. What were some of the things you learnt from the project, that you didn’t know before? Priya Ahluwalia: Doing all this research I found out so much stuff. The local councils in England don’t necessarily recycle waste that you throw away. Some of them are buying cheap land in places like Poland and dumping it there instead. You’re going down a rabbit hole when you start researching this and it’s stuff that I think none of us know. Everyone’s busy, everyone’s got things to do so you don’t think about it because you think somebody else deals with it. What are your plans for growing your label? Priya Ahluwalia: Ultimately what I want to do is to carry on designing with this newfound interest in being responsible. Wherever I go I want to be able to take this knowledge that I’ve gathered and researched and become interested in and help other companies do the same as that. I want to keep designing interesting clothes in a smart way while trying to reduce waste.